Hello friends! I’m finally back in the “saddle” so to speak – my STAMPtember goodies arrived the other day and I can join everyone else in sharing fabulous projects using Simon Says Stamp exclusive collaboration stamp sets. I do hope to go back to the days I missed (Gina K, Heffy Doodle, Sugar Pea and more) and share cards using those sets as well for more inspiration for you! What are Simon’s Exclusive Collaboration stamp sets? These are stamp sets and coordinating dies designed by various stamp companies exclusively for Simon Says Stamp. 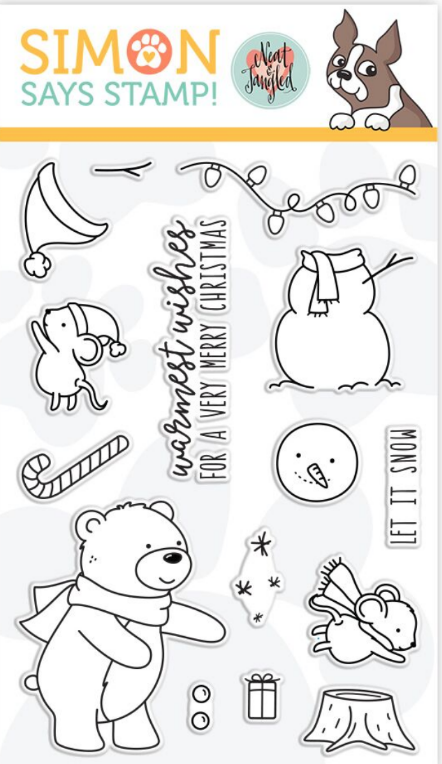 They have the look and feel of the traditional designs by a company, but the stamp set is only available for purchase from Simon for a limited time (usually during STAMPtember until the original stock sells out). 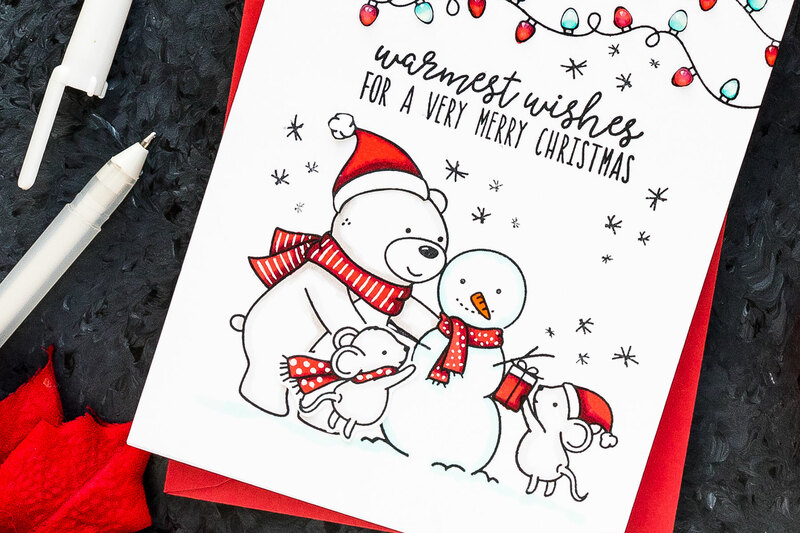 Today I have 3 minimalistic Christmas cards to share using Neat & Tangled Exclusive collaboration set. These aren’t one layer, but they are very close. These also don’t use a lot of supplies, there’s some coloring involved, but using minimum number of markers. Because sometimes less is more. 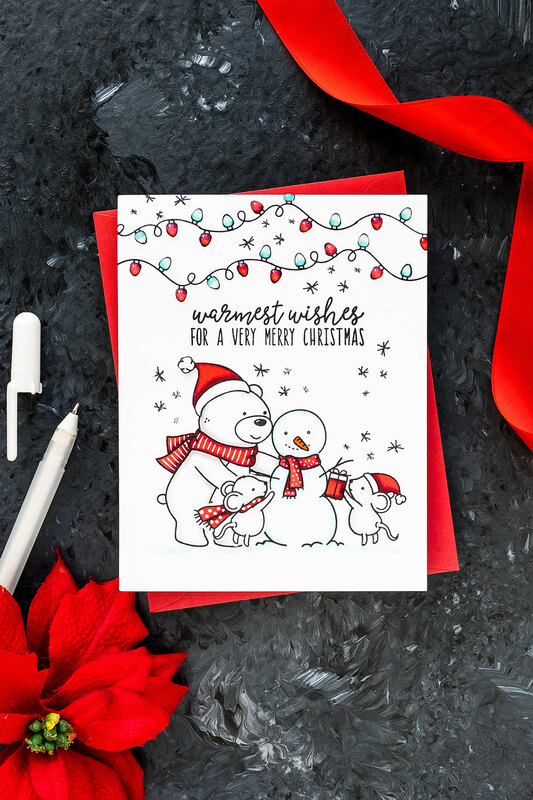 My first card features a simple stamped and (slightly) masked scene. The critters from Neat & Tangle’s set are absolutely adorable and they call for creating various little scenes using them. There are many variations to scene designs. Btw, little mice images are identical from the last year exclusive set. I also loved the light string image in this stamp set, I loved it so much I actually used it alone on 2 more cards (below). I went for a 2 tone card design and colored my lights red and teal. I used only 2 markers per each light to add minimal sharing – BG11 and BG 15 for teal and R39 and R24 for red. I coated each light with Nuvo Aqua Shimmer pen and also with Lacquer from Hero Arts for a dimensional glossy look. I used same colors plus several additional markers to color the entire scene. 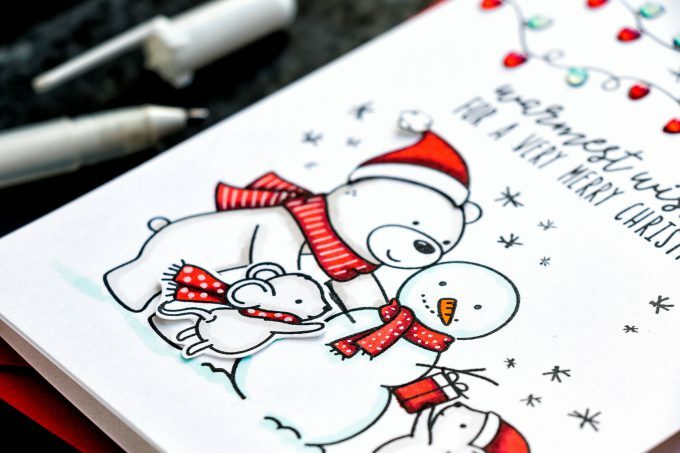 Additional marker colors are: R89 for deeper red shadows, W1 and W3 to color bear and mice. I also used my white pen to add patterned details to the scarves. I added stripes and dots – love this look! 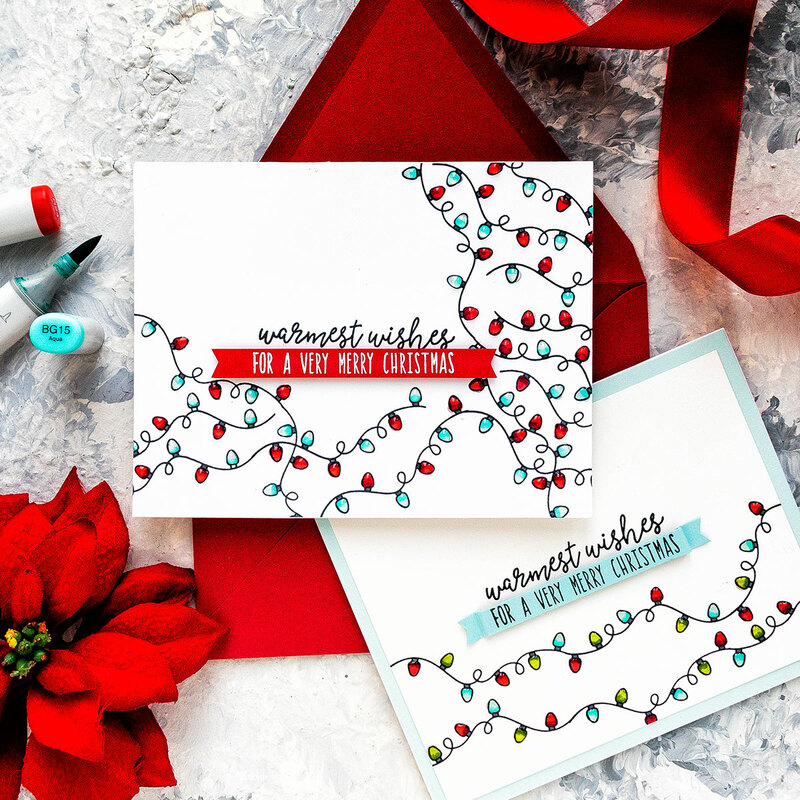 Here are the 2 additional cards using just the string of lights images – aren’t these fun? I was able to stamp them almost continuously by aligning the ends of the string. You can color these are color you like, I tried to stick to Red & Teal and also Red, Green & Teal color combinations. To add some interest to the sentiment I stamped/heat embossed it onto colored cardstock, trimmed into a banner and foam mounted onto the cards. Like it? Grab it now before it sells out! Oh what fun!!!!!! Thank you, Yana. When I saw this stamp set posted, I wasn’t really interested. But I love the cards you created with the strands of light. So festive. So adorable! TFS! Fabulous design as usual! Love the minimalist look! 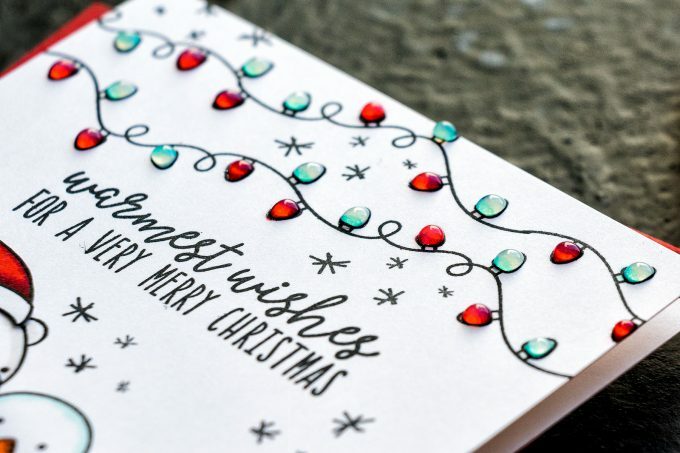 The 2 cards with the strings of lights are just fabulous and so festive! Love them! Very cute, fun & festive indeed. Like the minimal colour idea too, very classy. Love the lights.